I have failed this book twice and I was so sure that I won’t attempt reading it again. However, I have just finished re-watching The Lord of the Rings trilogy extended editions and reading the Three Great Tales of Middle-Earth that’s edited by Christopher Tolkien. I know this is not the recommended reading order but it’s only because of doing these two activities that I found a new interest, knowledge, and motivation to actually persevere and finish this book. Finishing The Silmarillion for the first time was one of the most difficult reads I’ve ever attempted in my life. It was so difficult that in my opinion, reading this book alone was harder than reading the entirety of Malazan Book of the Fallen. My main problem with it was that that I found it the first half of this book to be extremely boring. I’m talking about hundreds of names (characters, places, events) being fired non-stop at readers, monumental events happening in two sentences, and the extreme difficulty in caring with the characters because there was close to zero character’s thoughts exploration due to the biblical style of writing. However, after reading the three Great Tales of Middle-Earth, these names started to become more familiar and much easier to remember. In fact, when I got back to it, I found the second half to be so full of engaging and epic events. I won’t be reviewing each story in this book, there are way too many of them and I genuinely think a lot of Tolkienist can do a much better job in explaining the greatness of this book. Instead, I’ll say this. The First Age of Middle-Earth makes the event of the Third Age (events in The Lord of the Rings trilogy) looks like a normal skirmish. 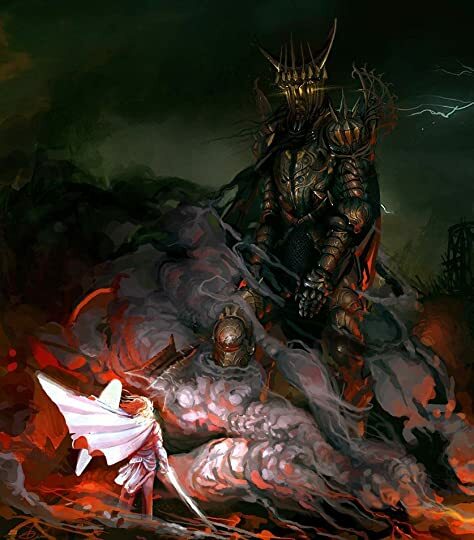 There were so many incredible and epic battle waged; tons of tragedy and loss; unmeasurable evil of Morgoth that makes Sauron looks like a brat. Out of all the stories included in this book, there were two that stands out the most to me. One is obviously the story of Turin Turambar that has already been told in full details on The Children of Hurin. I have done a full review on this story but to summarize it, I absolutely loved it and I have no doubt it will be even better upon a reread one day. The other favorite story was definitely the War of Wrath which depicts the final battle of colossal proportion that ended the First Age of Middle-Earth. It’s such a shame though that this chapter was super short. Like many of the stories contained in this book, I genuinely think that if the right author re-wrote these stories with multi-characters POV to follow instead of an omniscient biblical style of writing, War of Wrath would definitely be one of the most epic fantasy war to be written. 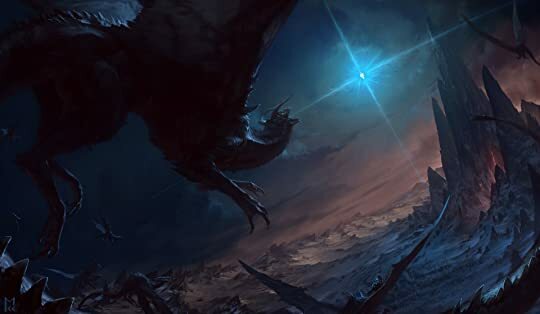 It’s seriously hard to explain the scope of this battle, instead, I’ll show you an image of the battle between Earendil (the tiny blue light in the picture) and Ancalagon the Black. The Silmarillion was not an easy read and the first half of the book was completely not fun at all to read. Due to the nature of writing style, there were also a lot of events that could’ve worked so much better rather than making me feel so distant. 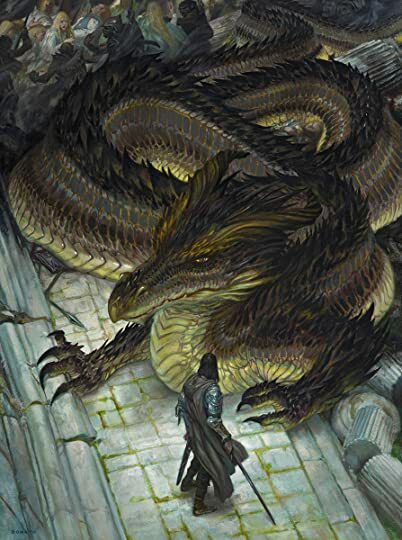 However, this book clearly shows Tolkien’s capability as a pioneer in fantasy world-building. I didn’t even know how rich the lore and history behind Middle-Earth was until I’ve read this one. I highly recommend this book for patient readers and obviously, fans of Tolkien. If you’re not a huge fan of The Lord of the Rings trilogy, I really think that it’s not mandatory for you to push through this book if it’s not working for you. Don’t get me wrong, there were a lot of great scenes that really shows Tolkien’s imagination at its highest level. But overall, I think I’m left wanting more out of the stories than feeling completely satisfied.